My podcast is (finally) live! After two other branding attempts and sitting on the original interviews for over a year, The Jeff Large Podcast is finally live. I run a podcast production agency. My team and I spend most of our time either producing branded podcasts for companies or consulting on how to produce their own branded podcasts. Thus, it’s only natural for me to have one. 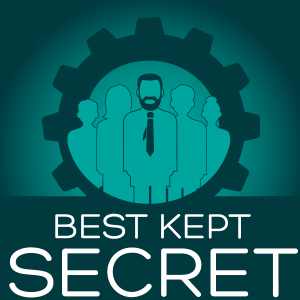 I originally had an idea for a podcast called Best Kept Secret and the premise was to pick the brains of amazing business people on their “secrets of success.” I recorded 7 interviews under that branding, and then let them sit for over a year. I simply didn’t have the time to keep up a podcast. We had several large web development jobs as well as podcast production jobs going for other clients. Come Alive Creative had a major shift during that time as well. We gutted nearly 2/3rds of our services (removing things like web development, graphic design, and copywriting) to focus solely on podcast production. In July of this year, I was feeling the pressure to get the podcast live but I had a few issues. I thought my original topic was overdone. So many podcasts interview smart business people. Another one would be unnecessary. Best Kept Secret didn’t really fit into any of our existing branding. 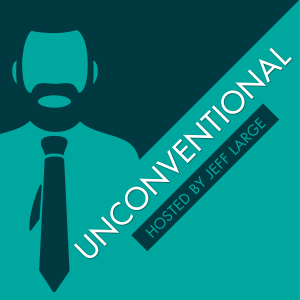 I re-branded the podcast under the name Unconventional: Not your average business podcast. The whole idea was I would break it up into thematic seasons and research particular topics relevant to my business. Plus I intended to test ideas and see what works in podcasting. So I began recording season 02 under that name. However, this had issues too. The name was not practical. The top search rankings for “unconventional” were all from dictionary.com and similar dictionary sites- highly unlikely I’d be able to beat them in organic search ranking. I broke the rule for naming things. Be clear, not clever. Unconventional made sense to me but it wouldn’t to anyone discovering the show for the first time. Unconventional didn’t fit into our existing branding either. I was losing my mind at this point. Do I burn everything I have to the ground and start fresh? But I didn’t want to waste my existing interviews. Do I rebrand it again?! It just made sense. I already rank the front page of Google for my name. Both Come Alive Creative and my personal brand align closely together. Plus, I get to focus on the topics that interest me. There is more flexibility in the show’s direction if it’s aligned to my personal brand opposed to my company. Here are my reflections from the last episode of season 03. I’m a big advocate of the Strengthsfinder test. My team and I have all taken it. It’s very insightful. One of my strengths that were identified is Input. I’m inclined to collect things; information in this case. For example, I love to look around at other non-related industries and see what motivations I can find and what I can apply to the work we’re doing. Netflix: Most podcasts are released on a routine basis either daily, weekly, bi-weekly, or monthly. But why? We live in an on-demand economy. Gone are the days of waiting for our favorite show to air every week. If you want to binge on an entire season of Stranger Things in one night, you will. I think podcasting should be the same way. 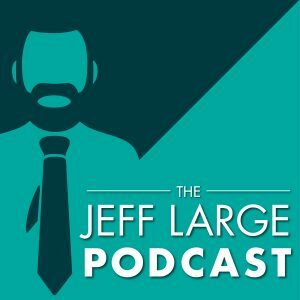 The Jeff Large Podcast will be released as complete seasons. Season 01 is live now. I’ll still market the individual episodes on a weekly basis but each season will be available to listen whenever you’d like. Snapchat (or Snap. Whatever): Snapchat constantly leverages the fear of missing out to increase app engagement. People like consistency and predictability but they also don’t want to miss seeing those random filters that only show up for a day or where people are with the map feature. To that end, my podcast will not always be the same. Season one starts with a short, several minute episode explaining things. Episodes 01-07 are interview-style and offer some reflections from me at the end. Episode 08 is a short recap of the week I had leading up to the podcast launch. Season two is already underway and will focus on why podcasting is important. Even so, I’m releasing “in-between-isodes” while that is being produced. My hope is the cast will be consistent enough to keep listener’s interest while being unique enough to keep them coming back. Chef’s Table: This is my current favorite series on Netflix. It’s a “Jiro Dreams of Sushi” style documentary of the world’s greatest chefs. Episode 01 of season 02 is a must watch. The episode focuses on Grant Achatz and his amazing ability to experiment with food and atmosphere. Achatz goes as far as ending the episode with plans to shut down his restaurant and completely recreate the menu. Why? To push himself. To see if he can. He wants to know what works. I want this podcast to echo Achatz’s philosophy. I have a lot of theories when it comes to podcasting and I know we’ve barely tapped into what is possible. The Jeff Large Podcast will be a medium to experiment, try new things, and see what’s possible. Gary Vaynerchuk: Gary Vee has a large social presence and many thoughts on entrepreneurship. One thought of his that I like is to document, don’t create. This podcast is my way of documenting running Come Alive. The podcast publicly showcases my research, learning, networking, and daily life in running the agency. For example, the current season was recorded at a time early in my business. I was doing a lot of wisdom seeking from people who were further along. Season 02 focuses on many aspects of podcasting. I want to learn as much about it as I can now that produce podcasts full-time. Who knows what season 03 will be about. I haven’t gotten that far yet. Please, check out the show. Tell me what you think via email or an iTunes review. If you like it, share it with your friends. I hope to get better with every episode and your feedback, good or bad, is incredibly helpful in that journey. Thank you for reading and let the adventure begin!